What Would Baby Jesus Think? What would baby Jesus think? 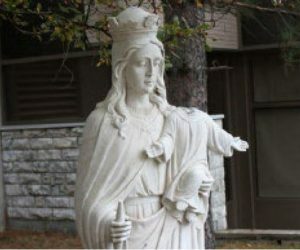 Apparently a white stone statue of Mary and the baby Jesus at a church in Sudbury, ON has been vandalized a few times over the years, decapitating the baby Jesus but leaving the head nearby – ‘cause really, what are you going to do with a baby Jesus head. A little hard to pawn. Pssst, wanna buy a baby Jesus head? The last decapitation took place a year ago but the head was nowhere to be found. The cost of replacing the head was prohibitive to the church and so it remained “as is” for months. A local artist came across the statue and offered to repair it at no cost – she had taken some sculpting classes at a local college but had never worked with stone…what could possibly go wrong? 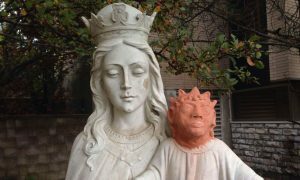 She spent hours crafting the bright orange clay head – you read correctly, a bright orange clay head for the white stone statue. The results were, to say the least, a little disturbing. The parishioners were upset and the priest had no idea what to do with the situation – “I wasn’t trained for this in the seminary”. Really? There isn’t a seminary class specifically geared towards what to do if your white stone baby Jesus is decapitated and a local artist replaces the head with a bright orange clay likeness of a gargoyle? The new head, whose already grotesque features are rapidly eroding in the rain, is just a temporary solution while the artist sorts out a permanent stone solution (back to college for a course or two). I’ll give her credit, her heart was in the right place, but sometimes you have to have a realistic grasp on your skill level – start small, like maybe a garden gnome or two just to hone your craft before you take a run at the baby Jesus. This just in – the original head has been returned; even the vandal(s) couldn’t deal with the melting orange head. Just give them the head back. The orange head has been removed to prevent further staining of the statue while plans are made to reattach the original and how to prevent further removals. The person who returned it offered that whoever had taken it was dealing with personal problems at the time. What kind of personal problem is resolved by stealing baby Jesus’ head? You got me. 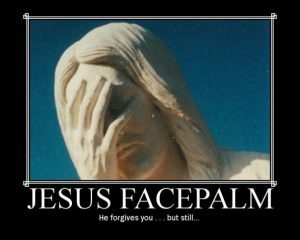 But even someone with some serious personal issues couldn’t handle the orange headed baby Jesus.